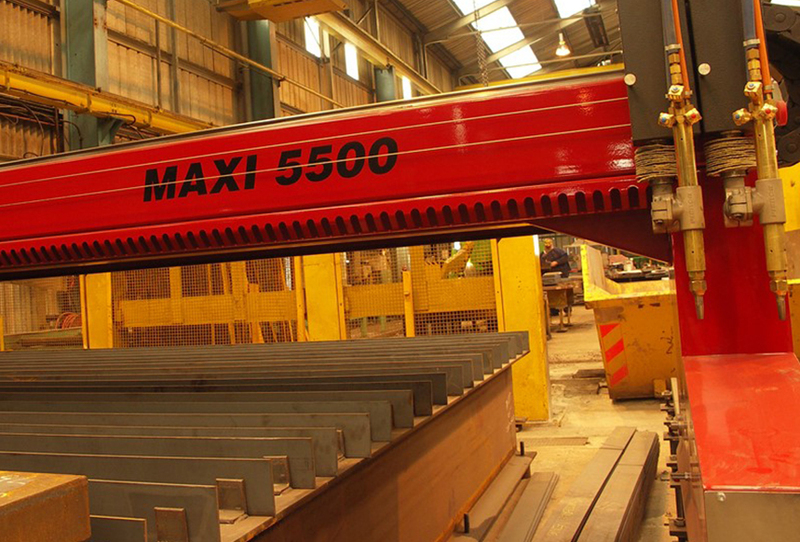 The Maxi profile cutting machine is designed specifically for large cutting applications. It features a portal frame constructed from a mild steel fabricated design. The machine is driven through twin side rack and pinion drives by servo motors and planetary gearboxes under the control of a high performance CNC system. The operators panel can offer the automatic selection of Hi-Lo preheat, automatic piercing, cutting torch selection, and speed adjustment. Large format heavy duty machines, available with cutting widths from two metres through to five metres wide, and with machine lengths designed for your specific application. The Maxi incorporates features to set this innovative machine apart from others. With unrivalled quality levels on every feature of the machine, the Maxi delivers a smooth running, low resonance and precision machine frame that can accommodate a wide range of cutting heads. With fabricated steel crossbeam, this stress-relieved and precision machined bridge has a strong, heavy duty structure that is up to the task for high speed plasma and gas cutting applications. Running on high precision linear rails and bearing assemblies that run the full length of the machine, the crossbeam guarantees unsurpassed accuracy when cutting. Accuracy is further enhanced with twin synchronised AC Servo motors and planetary gearboxes. The accuracy is given on a machine that offers cutting widths of 3.5, 4, 4.5 and 5m with bed lengths that can be bespoke to each individual application to suit single sheet or pendulum loading to maximise productivity. To find out more about our Maxi Range of profile cutting machines, please don't hesitate to get in touch for free advice, support, or technical knowledge.